Home > Philadelphia Rare Books & Manuscripts Co., LLC (PRB&M) > Tanglewood tales for girls and boys: being a second wonder book. Tanglewood tales for girls and boys: being a second wonder book. Boston: Houghton, Mifflin & Co., 1896. Small 4to (26.5 cm, 10.375"). Frontis., iv, 189,  pp. ; illus. 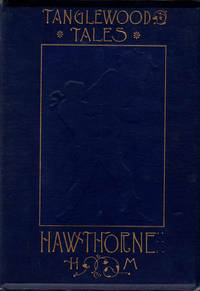 Hawthorne's first 'Wonder-Book' was so well received, that he was induced to undertake another within eighteen months from the time of finishing the first. This new volume, made up in the same way of Greek myths retold with a modern, free, half realistic and half fanciful tone, he gave the name 'Tanglewood Tales.'" The tales are illustrated with a frontispiece, 12 black and white plates, and numerous in-text and headpiece illustrations. Provenance: From the library of American collector Albert A. Howard. A name-stamp of "H.H. Howard" on the front free endpaper. Publisher's navy beveled boards with gilt lettering to spine and front board, all edges gilt; gilt illustration of Theseus and the Minotaur that is supposed to be mounted on front board is laid-in, extremities rubbed and bumped, spine slightly cocked. Endpapers age-toned, numbered sticker on front pastedown, one leaf loose from binding. Title: Tanglewood tales for girls and boys: being a second wonder book. Size: Small 4to (26.5 cm, 10.375"). Frontis., iv, 189,  pp. ; illus.